We are introduced to another of the “twelve spriggan members,” Jacob Lessio. Mavis notes that she is concerned that there isn’t any movement among in he east. Jacob quickly confirms Mavis’s initial thoughts. He touts his ability as an assassin, claiming that he has “never” failed. He explains the best practice of assassins. He uses his ability to “move” the Fairy Tail guild into another dimension. Mavis is shocked when Jacob can see her. He quickly starts to attack her. He asks for the location of her body. He offers an exchange. 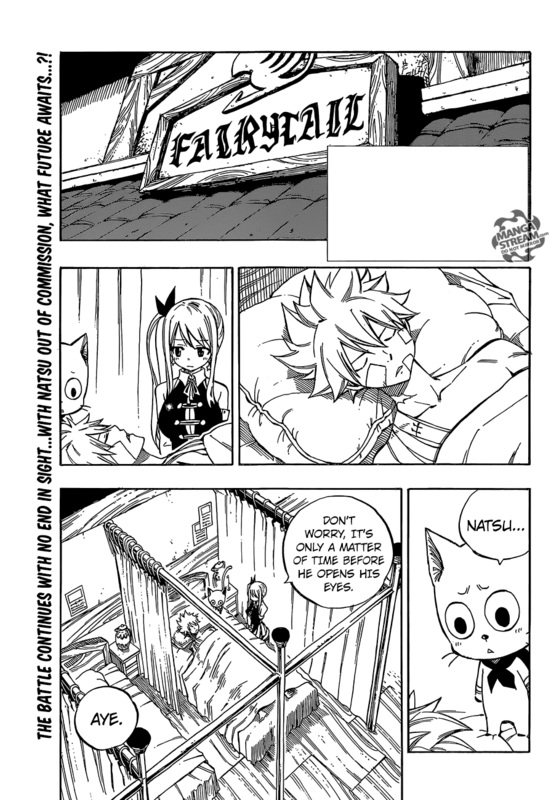 The Fairy Heart for the return of the Fairy Tail members. Mavis questions his sincerity, when Lucy interrupts Jacob but kicking him in the back off the head. 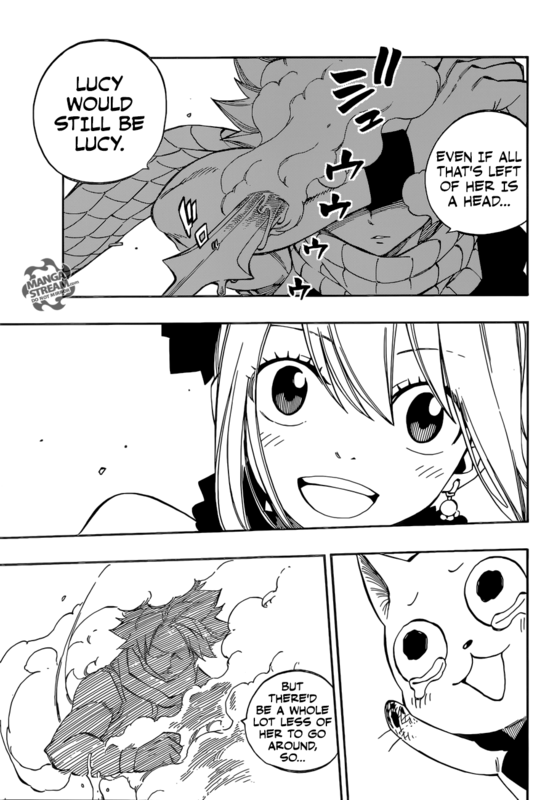 Jacob is surprised to see that Lucy and Happy avoided his “space magic.” Lucy explains that, Horologium save both her, Natsu and Happy. Jacob decides that he going to “slice” Lucy into pieces. He throws a dagger at her head and Natsu blocks it. I’m glad to see the original team of Natsu, Lucy and Happy back together. 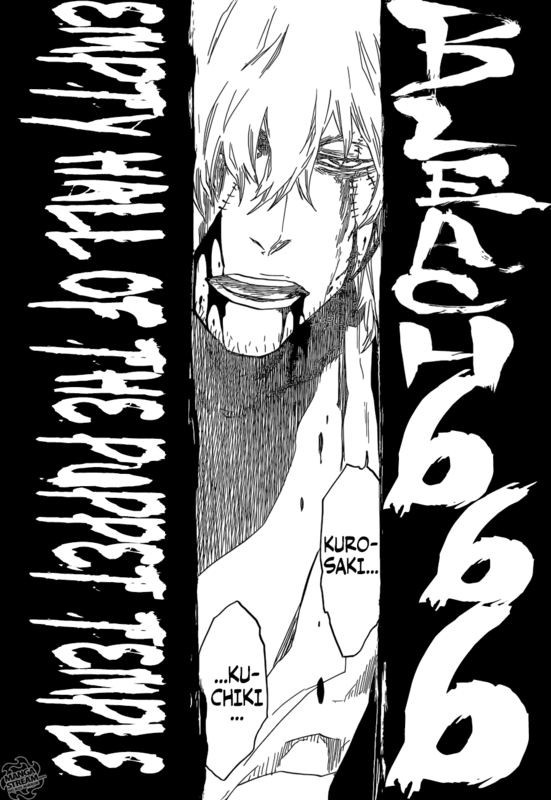 Nothing really profound occurred in this chapter as it was primarily just set up of the upcoming battle. Part of me thought Lucy would defeat Jacob by herself. However, the history of Fairy Tail, Lucy almost never defeats anyone. 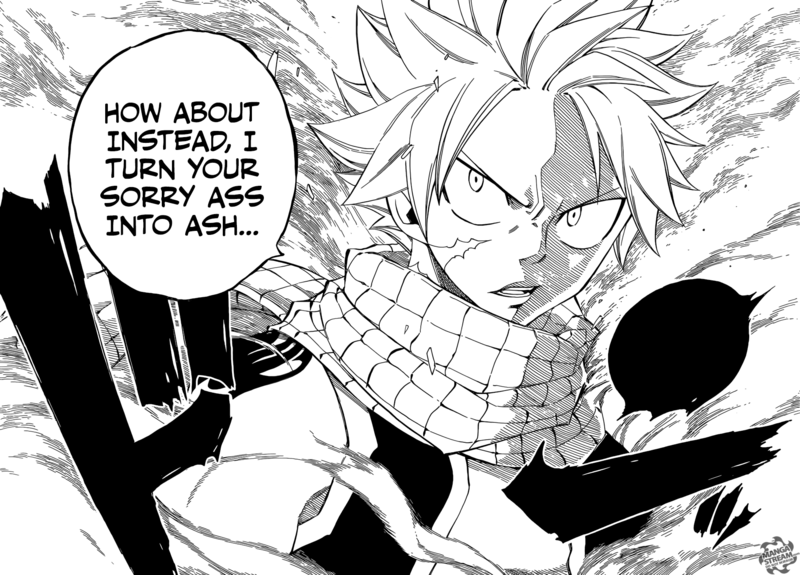 Anyway, love to see what Natsu brings to this fight. Inuarashi and Nekomamushi recount their past. They reveal that they were the “vassals” for Lord Oden. The were aboard the ships of both Roger and Whitebeard. The Strawhat’s are understandably shocked by these revelations. The samurai also have meet with Whitebeard. 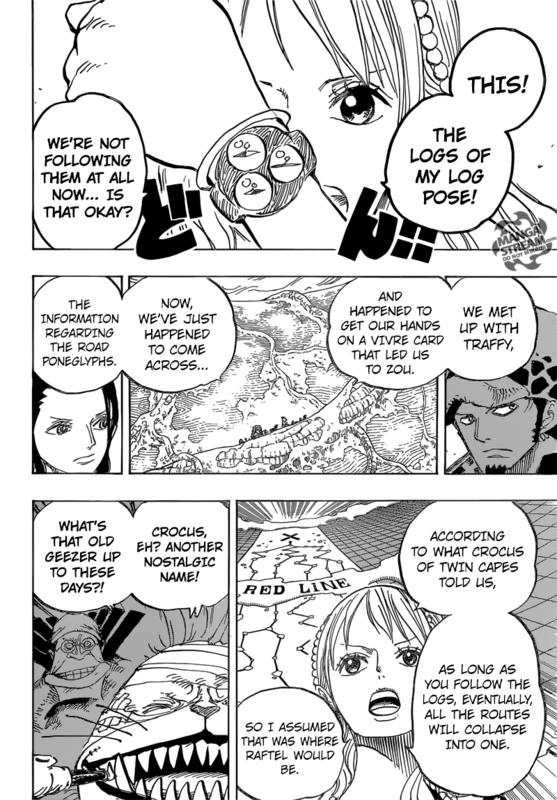 The Straw Hat’s celebrate Nami’s ability as a navigator. Neko say’s that he was gathering samurai for their war against Kaidou. 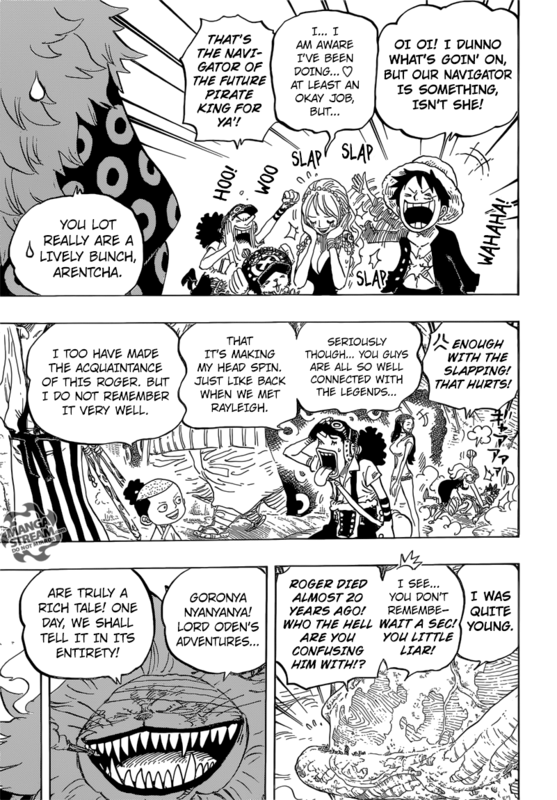 He says that they need to fine the former first commander of the Whitebeard pirates, Marco the Phoenix. Luffy remembers that Marco protected him during the war. 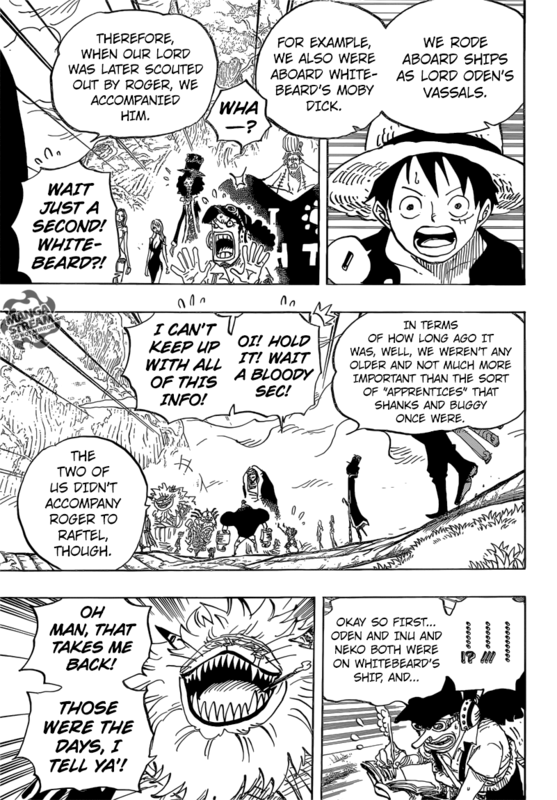 Neko reveals that Whitebeard’s crew have basically disappeared. Blackbeard’s crew clashed with Whitebeard’s former, leaving the Whitebeard crew demolished. This encounter gave the rise to Blackbeard becoming a Yonko. They decided to split up, but meet in the Wano country. The minks, reunite with Raizou as Luffy and the others prepare to go get Sanji. Zou start shacking (crying) as Luffy hears a voice. 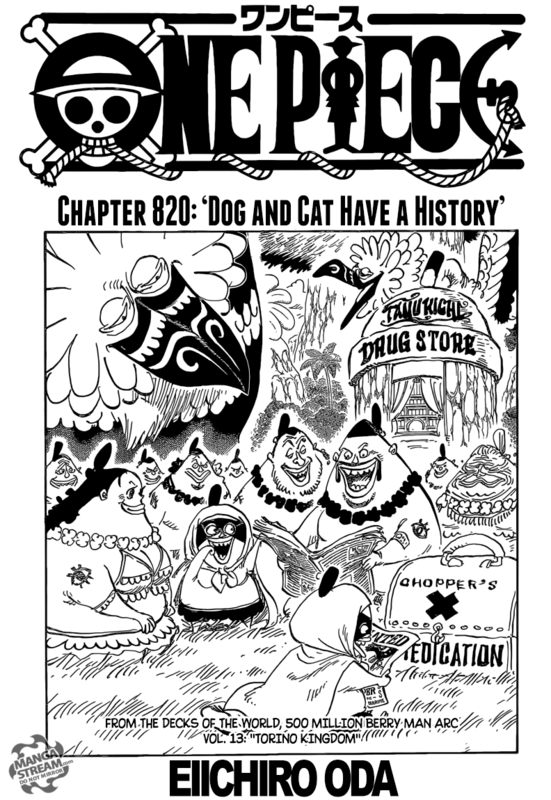 One Piece continues to expand it story history. The demise of the Whitebeard pirates was heartbreaking. We were told that the Blackbeard pirates have terrorized the pirate community. Stealing the devil fruit powers from various pirates. Blackbeard being brought back up reminded me that when we last saw his crew, they were going to be in conflict with the Revolutionary Army. One Piece has so much going on right now, I’m really excited. You would think that after have one’s heart ripped out Askin would be dead right. Well you would be wrong. 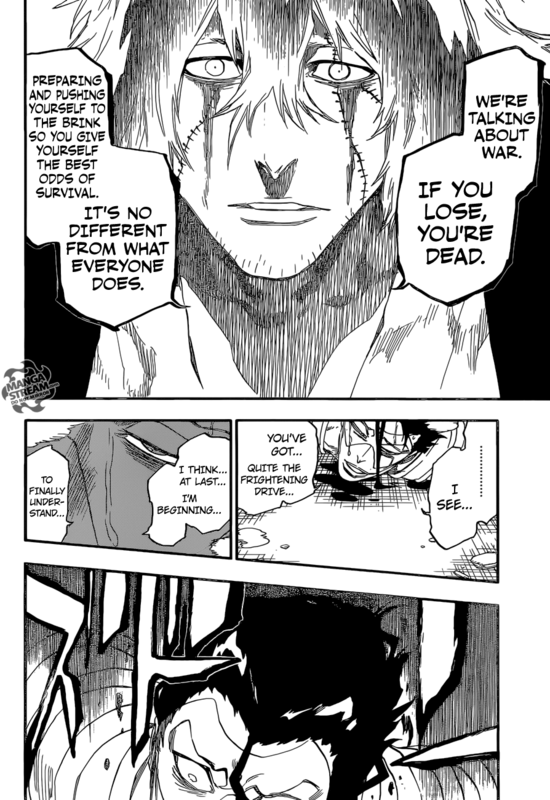 Kisuke explains what we already know, that he think far ahead to prepare for most predictable outcomes. According, to him “1000 what-if scenarios.” Grimmjow, unceremoniously attacks Askin again, stabbing him with his claws. Unsurprisingly, this fails to kill Askin. He announces that he has basically a “dead man’s trigger,” upon his death “the power of his Gift Ball Deluxe,” increases. He mocking claims that he is sure Kisuke will figure a way out of it. A sign that Kubo listens to his fans, Askin says he won’t bother to explain his powers again. Nelliel Tu Odelschwanck appears outside the Gift Ball. She seem to have suggested that Kisuke assumed that this situation was always a possibility. 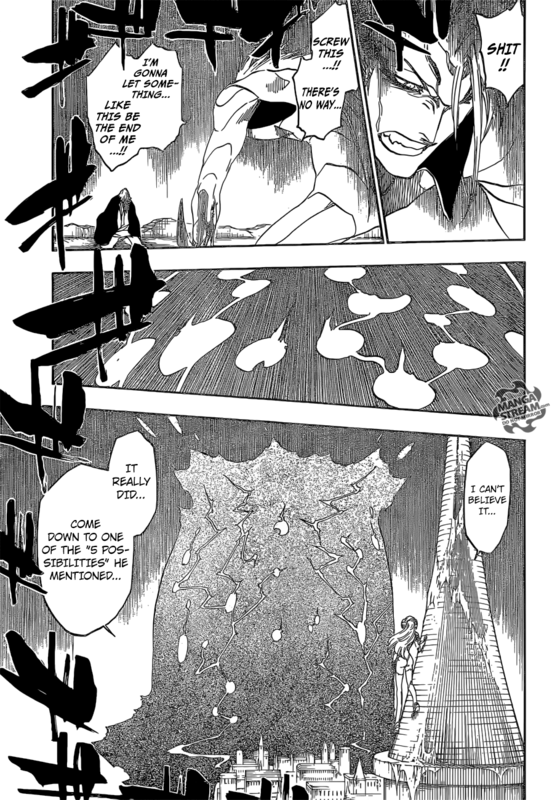 She also implies that she is prepared to save Kisuke and the other. Meanwhile, we head to the battle between Hitsugaya and Gerard. Hitsugaya is completely ineffective against Gerard. However, Byakuya interfere’s using his Shikai. Hitsugaya makes a height joke with Byakuya. It didn’t really land, but was interesting attempt on Kubo’s part. Anyway, Byakuya isn’t known for his sense of humor. As Gerard attack’s, his hand is severed by Kenpachi. This chapter was epic for one reason only, Kenpachi. It seems to make perfect sense that he would be the one to handle Gerard. Many characters in Bleach have had a my powers are “unstoppable.” Gerard is similar to Gremmy Thoumeaux or Nnoitra Gilga in this way. I would doubt that Kenpachi would need help from several Captain level Shinigami’s (he certainly with refuse them anyway). However, due to this I think that there may actually too many Shinigami and Arrancar for the small number of Quincy. If my count is correct there is only three Quincy left (Gerard, Haschwalth, and Yhwach). If we assume the Askin is dead, of course. Now we have Kenpachi verses Gerard, Uryu verses Haschwalth and Ichigo verses Yhwach what will the others do, who would they fight? 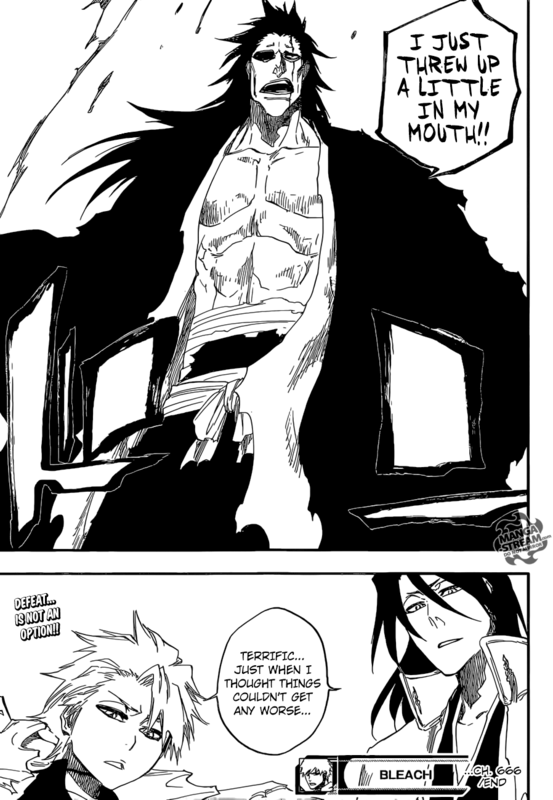 According to Yhwach, Uryu is powerful enough to surpass him at some-point. So he might not need help against Haschwalth, once Ichigo awakens Yhwach. I going to assume that they work together against either Yhwach or Gerard. We’ll see. Next Post FLCL returns for Season’s 2 and 3. Haha. One moment Nami is bashful and in the next panel she is smacking him cos the slapping hurts. I love the humor in One Piece.